Trim leek roots; cut leeks lengthwise in half (to about 1/2-inch from root end), leaving root ends intact. Rinse thoroughly under cool running water; drain well. Arrange in single layer in steamer basket. Steam leeks in large saucepan over boiling water, covered, 10 minutes or until tender when tested with tip of knife. Cool to room temperature or chill. Whisk oil, vinegar, mustard, salt, and pepper in small bowl. Spoon over leeks. 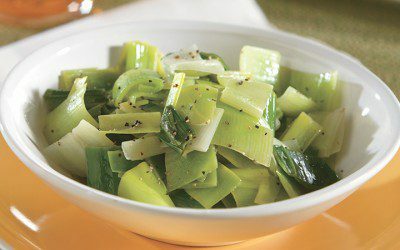 Note: Although sometimes sold individually, leeks are usually displayed in bunches of 3 or 4. The smaller the leek, the more tender it will be. Leeks over 1 1/2 inches in diameter can be tough and woody. Choose ones with firm bright green stalks and white blemish-free bases. Avoid leeks with split or oversized bases. Exchanges per serving: 1/2 Fat, 2 Vegetable.